Our boys are the main milkers here on our farm. They have strong hands to prove it. I am very grateful to them for all their hard work around here. Having a milking animal changes life pretty dramatically. She’s a big part of the family. She requires attention and care daily, but we are rewarded with lots of good fresh milk. May still has a calf nursing on her. So we are managing the calf and the amount of milk we are getting. The calf is close to weaning. Congratulations on starting your agrarian adventure! Let us know how we can be an encouragement along the way. 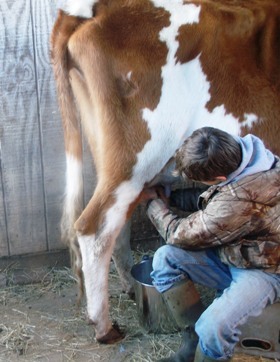 Here are some general rules about milk cows. They are mammals like humans, so they only produce milk when they give birth or “freshen”. We typically try not to milk for more than a year without a dry period, but others have told stories of how they have kept a cow in milk for much longer. You can wean the calf at three days if you have a need for more milk and a desire to bottle feed the calf. We have found the calves to be healthier and heartier the longer we leave them on the momma. Most sources recommend the calf have a bottle or nurse for 90 days as a minimum. Because we want to have a regular supply of milk we try to bred the cow back a few months after giving birth. We milk her through most of the gestation period and then dry her off a couple months before she calves again. This allows her a bit of a recovery time before we start milking again. I hope this helps. I’m working on some resources that will have much more detail on our milk experiences and books and videos we have found to be helpful along the way. Will May continue to give milk after the calf has been weaned? If so, for how long afterward? And, do youhave to breed May every year in order to get milk? Rookie questions…I know. BTW, I have been lurking about reading your blog from some time now. I have become especially interested in the past two weeks since my wife and I have decided to leave our “city” life for a more agrarian approach.